Horror's not normally my thing. While I enjoyed it as a young adult*, it's not a genre to which I gravitate anymore. Which is why I was a little surprised to look up and realize that the past four books I've read have been ghost stories. What's been in that stack? Ghost Hawk by Susan Cooper. Grades 5-8. Margaret K. McElderry Books, 2013. 328 pages. Review copy provided by publisher. 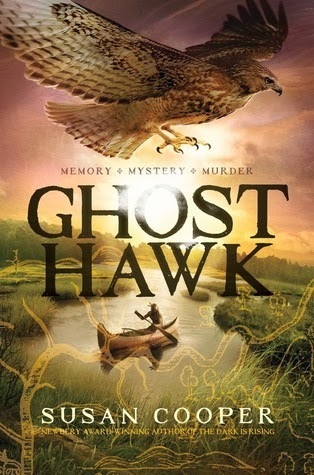 Too much plot summary is going to get all spoilery, so I'll just say that Ghost Hawk is the story of a Native American boy in Massachusetts around the time of the first white settlements (think Plymouth and Puritans). There's a good deal of adventure and historic detail (which may or may not be accurate, unfortunately). First of all, I have to say that I enjoyed reading Ghost Hawk. I knew it was coming under some controversy on the Heavy Medal blog, so I avoided reviews and reading through the comments until I had read it. Even though I enjoyed the read, I take Debbie Reese's comments about the portrayal of Native Americans seriously and even if you play the fantasy genre card, a book that's based on real people needs to be accurate. End of story. In her author's note Susan Cooper claims that this is not a historical novel but a fantasy in a historical setting. If you're using real people (and Susan Cooper is), you owe it to readers to be as accurate as possible. I honestly don't even see why this is a debate. 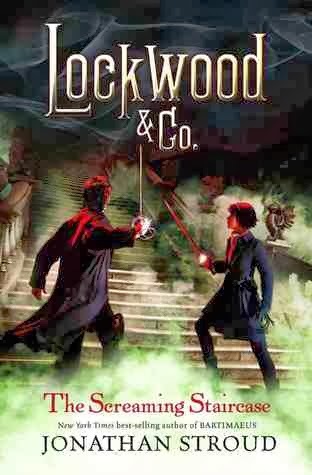 The Screaming Staircase (Lockwood & Co. #1) by Jonathan Stroud. Grades 5-8. Disney-Hyperion, 2013. 400 pages. Review copy provided by my local library. Oh my, this one was a blast! Set in an alternate England where hauntings are viciously real and children are the ones who can sense the Visitors, this is the story of Lucy Carlyle and the ghost busters who hire her. Lockwood & Co. is fairly unique among ghost disposal agencies because they don't have any supervising adults. They don't need them! Lockwood and his staff have everything taken care of. And if a house gets burned down once in a while, well, at least it's not haunted anymore, eh? But Lucy and her colleagues will face the biggest challenge of their career when they're approached by an eccentric millionaire with the most haunted house in all of England. This is a believably creepy mystery story that puts kids logically into the center of the action. There are enough scares to please your horror fans (especially that climax!) and a solid mystery that will keep readers guessing. Lucy is a likeably imperfect heroine; her gifts give her an edge, but she doesn't always make sensible choices (much to the chagrin of her colleague and boss). This is the first in a trilogy and it wraps up enough while still definitely paving the way for following books. This one is a recommendation from The Boyfriend who recently read and enjoyed it. I'm enjoying it well enough, though it feels like it's overwritten. (Sigh. I often feel that way about adult novels after reading so much slim and tight youth lit.) 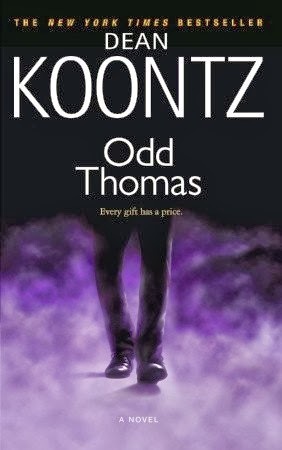 Odd Thomas is a 20-year-old short order cook who sees ghosts in his small California desert town. When he spies a strange, repulsive man being followed by masses of shades (a good indicator that this man will be committing a very violent crime soon), Odd must figure out what's going to happen and how to protect his friends. The narration is solid and fits with the character, though there are pronunciations I don't agree with every now and then. 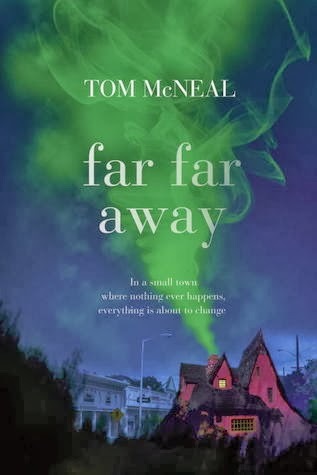 Far Far Away by Tom McNeal. Grades 7 and up? Knopf Books for Young Readers, 2013. 384 pages. Review copy from my local library. This one is for the Bill Morris Seminar, which I'll be attending in January**. We have a list of books to read, which we'll discuss at the seminar. The ghost of Jacob Grimm (yes, that Jacob Grimm) is following a teenage boy in the town of Never Better. Jeremy is the only person Jacob has met who can hear ghosts and Jacob is charged with protecting him from an evil that will befall him at some point. I'm only halfway through at this point, but I'm having some trouble figuring out who the audience is meant to be. Really, the main character is a 150-year-old ghost and Jeremy's story is told with a distance that keeps the reader from connecting to him. I do like the modern fairy tale tone, but I also have some other issues that I won't get into quite yet since I haven't finished it yet. So that's the state of my haunted reading pile! Have you ever unintentionally found yourself reading a bunch of books in a row that had a running theme? ** Oh yeah, I was selected for the 2014 Morris Seminar! I'm super excited!!!! Wheee!